It's that time of year! And by "time of year," we're talking about standing in endless lines, catching untold illnesses, and wondering where all of those spare vacation days went. But it doesn't have to be that way. If you're on the hunt for the perfect gift for that special someone, you can save yourself tons of time and stress by deciding on a product ahead of time. If you're looking to gift the road warrior in your life with some new technology, here's a list of gizmos that any traveler would appreciate. iPad mini ($329+): Yes, it's the easy choice. But it's more than just Apple's best tablet ever, in my humble opinion. It's way more portable than the full-size iPad, significantly more affordable than the original, and it has a trick that travelers will love. Pick up the Verizon Wireless LTE version, and watch as your new tablet turns into an LTE hotspot with a battery that will keep your Wi-Fi devices online for up to 12 hours. Sanho HyperJuice Plug ($130): You never need portable power until you need it. Once you do, however, you really need it. This one's great to shove in your carry-on, as it can charge up your phone and iPad (or anything else using USB) without you having to hunt for an airport AC outlet. Oakley Airwave goggles ($600): Believe it or not, goggles can be gadgets. As you prepare for ski season, you'll appreciate that these have GPS, Bluetooth, and heads-up display technology. They'll give you instant access to an avalanche of information, including maps, temperature, jump analytics, speed, playlists, and even the location of your mountain-bound friends. Right on the screen. Oh, and there's an accompanying iOS app to peek the data there. 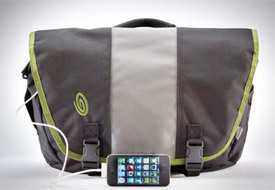 Timbuk2 Power Commute ($199+): If you know someone who needs a new travel bag, this one includes the ability to charge your gadgets while holding your other carry-on essentials. Contour+2 action camera ($400): This tiny camera won't be a burden in your backpack, and it can capture HD video on the slopes, through the woods, or in the water. That's right, it's waterproof! It may be cold in the States, but you're just a flight away from the Southern Hemisphere. TripIt Pro subscription ($49): If you just can't put your finger on a device to hand to that picky person in your life, why not hand them a 1-year subscription to an amazing trip management platform? The Pro edition adds instant mobile alerts when flights or gates change, automatic notification of refund eligibility should your flight fare decrease after purchase, and a briefcase that keeps and tracks all of your travel membership numbers. They'll be more organized, and they'll only have you to thank. 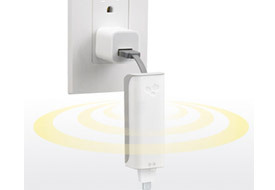 Kanex mySpot ($60): For those who frequently find themselves in hotel rooms with only an Ethernet jack, this is the ideal solution. It takes a single Internet cable and creates a Wi-Fi hotspot, enabling one's laptop, phone, tablet, and e-reader to hop online at once. Talk about spreading the love! Scottevest SeV Fleece Jacket 7.0 ($160): The avid traveler would certainly make use of a coat that includes plenty of pockets for shoving extra items through airport security. This one keeps its wearer warm, while keeping their iPad, charging adapters, and other aircraft essentials close to their chest. Olympus Stylus TG-610 Tough ($200): If you're responsible for gifting someone who tends to be a bit clumsy, here's an option. This camera is a solid, rugged piece of kit, which is great for being dropped, beaten, and crammed into suitcase after suitcase. Good luck stuffing those stockings! Check out our other 2012 travel gift guides for the holidays.